Do you like to keep your stainless steel popper looking sharp? A brand new cleaner is now in stock that will make it easier than ever! 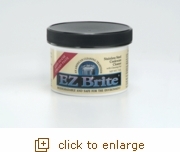 We're excited to carry EZ Brite Stainless Steel Cookware Cleaner on our site! Fine polishing compounds, food-grade citric acid and a hypoallergenic, phosphate-free, environmentally safe soap are combined to make a cleaner that will cut through kitchen grease, remove tarnish and restore luster to your non-lacquered stainless steel, chrome and glass or ceramic range tops and cookware (like the Whirley-Pop or Sweet & Easy). If you're a frequent user of your stainless steel Whirley-Pop or Sweet & Easy Snack Machine, or are making lots of batches at a time (or really just like to keep your kitchen appliances like new), then you'll want to add EZ Brite to your cart! Directions: Apply with damge sponge applicator (included). Rub in circular motion. Rinse promptly and thoroughly with warm water. Dry completely with soft cloth to avoid water spots. Wring out sponge and return to container. In case of eye contact, immediately flush eye with running water, rinsing carefully under upper and lower lids. Rinse for 10 minutes. If irritation continues, seek medical attention. Special Note for Aluminum: Product can be used on aluminum, but please read the following information closely before use. Product contains food-grade citric acid and salt in it. These ingredients will clean aluminum, but they need to be rinsed immediately after use. If you do not rinse immediately and well, you run the risk of your aluminum blackening due to acid exposure. Wabash Valley Farms is not responsible if this occurs. Thank you for your understanding!